Chuan Fa Academy is a small traditional neighborhood martial arts dojo. Located conveniently in the Waldo/Brookside area of Kansas City. We are not a franchise or cooperate studio. Owned and operated by Sifu Chris Hutchings this school is rooted in traditional training and self defense. Chris has 20 years in martial arts training and 12 practicing Chinese Kenpo or Chuan Fa. Currently Chris is a member of The Five Finger Fist Society, a society of martial artists dedicated to practicing and passing down the traditional Kenpo System. We are a classical dojo with real family values. A small traditional school doesn't usually accept as many students since the style taught properly takes a lot of individual attention. Once accepted we offer a unique and refreshing training environment. The style and training methods are focused on street self defense and proper application of technique. Ranks are earned not bought. We unlike many traditional schools accept children as young as 5 years old. Though we don't offer a program or system that's been watered down for children. We teach traditional Chinese boxing or "Chuan Fa". Children must train and study just like any other student. All students and their families are seen not as "clients". But as students and family in the martial arts. Training, loyalty, understanding, and honesty come before business. We are here to pass down the traditional art of Chuan Fa. The system taught here is old school. We adhere to the traditional training rather than water it down for the sake of profit. There are no test fees or extra charges. Testing and rank is based off each students individual process, and understanding of the required material. We open our doors to anyone wanting to learn self defense. Call and ask for options on self defense training. We also offer self defense seminars. Chuan Fa Martial Arts Academy is dedicated to providing a fun, safe, clean enviornment for students to train in. 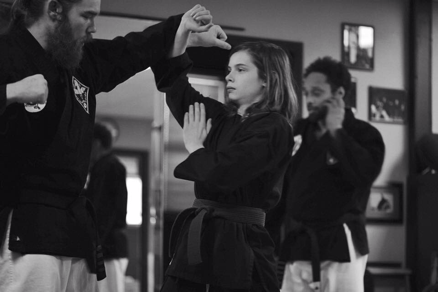 As a traditional dojo we are focused on self defense, character development and role modeling. Call or email to set up a time to observe a class or to talk to Mr. Hutchings, owner and instructor of the academy.